Sligo's Pat Hughes (left) and Jamie Clarke are both handed one-match suspensions by the GAA for their dismissals last weekend. 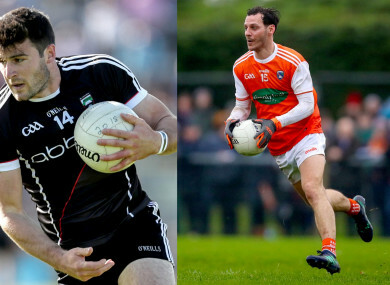 THE GAA HAVE upheld one-match suspensions for Armagh’s Jamie Clarke and Sligo’s Pat Hughes for separate incidents during last weekend’s Allianz National Football League second round. Sligo were beaten hosts as Down snatched a late two-point victory at Connolly Park last Sunday afternoon. Hughes was Sligo’s top scorer on the day and it appeared his efforts had guided Paul Taylor’s side to victory when he was dismissed in the 68th minute for a high challenge. But an injury-time goal condemned them to their second defeat of the campaign. The Central Hearings Committee today confirmed the ban which will see Hughes absent for their Division 3 clash with Laois this weekend. Jamie Clarke, meanwhile, will be unavailable for Armagh’s Division 2 match against Meath on Sunday. The forward was sent off before half time during the his side’s draw with Clare last weekend after an apparent elbow on marker, Kevin Hartnett. Suspensions have been upheld for the pair, who now both have the option to appeal before the GAA’s Appeals Committee. Email “Armagh and Sligo stars set to miss league games as bans are upheld ”. Feedback on “Armagh and Sligo stars set to miss league games as bans are upheld ”.